Russian aircraft giant Ilyushin has announced plans to restart production of its Il-96 airliner amid fears of possible U.S. sanctions against the Russian air industry. Manufacture of the four-engine giants was stopped several years ago but there is now a possibility the airliner, which is currently used only by the military and the government, could see a return to civilian use. Russia plans to resume mass production of the four-engine Ilyushin Il-96 aircraft, the Ilyushin Aviation Complex's chief designer Nikolai Talikov told reporters in the central Russian city of Ulyanovsk on Nov. 6. A year ago, the resumption of mass production of Russian long-haul aircraft was out of the question; on the contrary, Aeroflot was removing the Il-96 from its fleet. In all, the airline had six Il-96-300s, which had been used since 1995. The air carrier attributed the decision to the aging planes and their low economic efficiency. The aircraft were to be replaced by the American Boeing 747 – the very plane that the Il-96-300 was originally created to compete with in the post-Soviet era. However, in light of the political tensions between Russia and the U.S. and the ongoing economic sanctions against Moscow over its role in the Ukraine conflict, the current dependence of the Russian air industry on Boeing and Airbus is seen as a potential weakness. The Il-96 was Russia's first long-range wide-body passenger aircraft. The test flight from Moscow to Petropavlovsk-Kamchatsky and back without landing in Petropavlovsk (a total of 9,200 miles) took 18 hours 9 minutes. Much attention was paid to the safety of flight-control systems. Its fly-by-wire control system is duplicated by the mechanical system, where all the efforts of the wheel and the pedals are transferred to the handlebars through cable runs, so that the pilot should be able to land the plane manually in case of failure of electronics. Pilots who flew these aircraft note their reliability and simplicity. "I landed the Il-96 six times with a simulated failure of all engines. It was the task of the chief designer. I can tell you that nothing like this was done on any foreign aircraft of this type," the Il-96's test pilot Anatoly Knyshov told RBTH. His son, Sergei Knyshov, the Il-96's youngest commander, a former Aeroflot pilot, agrees that the Il-96 is among the safest airplanes: "During all the years of its operation (since 1993), the Il-96 has never seen a plane crash," he said. Yet despite its advantages, the plane became seen as inferior to its rivals from Boeing and Airbus and production was suspended in 2009. The move was largely seen in Russia as a result of efforts by the Western aircraft manufacturers' lobbyists, and according to Anatoly Knyshov, made little economic sense: The Il-96's per hour flight costs were $1,000 less than the Boeing 767-300ER's. 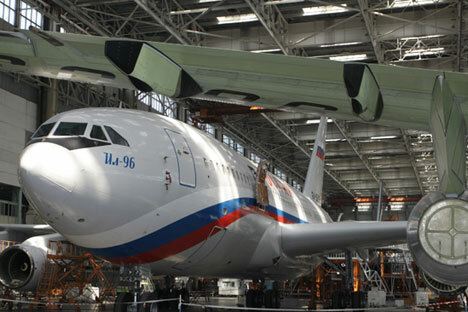 Over the years, interest in purchasing Russian-made long-haul aircraft was shown by Venezuela, Peru, China and several countries in the Middle East. Some countries even signed the relevant agreements, but the Il-96 took off only in the Caribbean, including one Russian aircraft which was delivered to Cuba as a presidential plane. Now the airline Cubana de Aviación operates five of these planes, and its passengers highly appreciate flying on airplanes of this type. The Il-96 can carry 300 passengers, consuming only seven tons of fuel for four engines, while the Boeing carries 200 passengers and uses six tons for two engines. In Russia, the Il-96 currently does not carry ordinary passengers. Eight aircraft are operated by the Rossiya special flight squadron engaged in transportation of officials, including the president. In early 2014, the presidential office said it had ordered another two Il-96-300s from the Voronezh Aircraft Plant, to be delivered by the end of 2015. Prior to the recent announcement by Ilyushin, the Il-96 was partially "saved" by the Ministry of Defense, which in 2013 ordered the construction of aircraft-tankers based on the cargo version of the Il-96-400. The upgraded version should carry more than 65 tons of fuel and fly over 8,000 miles, refueling missile carriers and long-range interceptor aircraft during their combat missions. The first two aircraft are expected to be delivered at the end of 2015. Now, taking into account the changed circumstances, there is a real chance for the resumption of mass production of the Il-96, and, hence, the use of these aircraft for commercial traffic. "If sanctions on Boeing and Airbus are introduced, you and me and 143 million passengers will transfer to the railways and road transport, while in 60 percent of the territory of our country, where there are neither railways or nor highways, our population will be forced to transfer to dog and reindeer teams," Oleg Smirnov, an Honored Pilot of the USSR, said in an interview with the Business FM radio station. "This is a joke, of course, but nevertheless, the first to realize that it had become a matter of national security was the president of the Russian Federation. It was him who gave the command to deal with the Il-114 aircraft... Now the Il-96 is at the stage of consideration." Given the relative speed of the transition from individual to mass production, the possibility of seeing the Ilyushin giant carrying passengers in the sky once more is now quite high.